Kennedy Brown was two months old when her UW Health pediatrician, Richard Ellis, MD, noticed an abnormality in her head shape. Her parents, Matt and Vanessa of Fitchburg, Wisconsin, were told that their daughter's skull was expanding in length, but not in width. A condition known as sagittal craniosynostosis was ultimately diagnosed, meaning that bones within Kennedy's skull had fused together instead of stretching and producing new bone to accommodate normal brain growth. To remedy the situation, Kennedy's skull was surgically repaired in January 2011 by UW Health Pediatric Plastic Surgeon Delora Mount, MD and UW Health Pediatric Neurosurgeon Bermans Iskandar, MD. "Dr. Iskandar and I treated Kennedy by creating an ear-to-ear incision," says Dr. Mount, "and then removing the prematurely fused bones in her skull, creating room for her head to grow in width as well as length. Within just a few weeks, her head began assuming a more normal shape. She did just great and her family was wonderful." Having a child undergo neurosurgery is never easy, but the Browns say American Family Children's Hospital caregivers did everything possible to alleviate the stress. "During surgery, the nurses came out every hour to assure us that things were going just fine with Kennedy," says Matt. "That very day, we got to hold her after surgery and it really just made the whole experience so very comfortable for us and for her." Vanessa agrees, noting that staff frequently assisted in many ways, including keeping friends and family aware of Kennedy's developments. 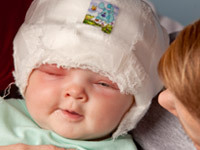 Just one month after surgery, Kennedy's head became noticeably more normal in shape. Aside from a few routine follow-up visits this year, Kennedy should be on her way to a completely healthy life. "She's doing just awesome," Vanessa says. "We're very happy."